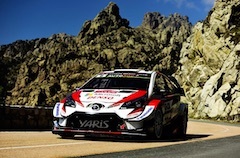 TOKYO, Apr, 01 2019 - (JCN Newswire) - The strong performance of the Toyota Yaris WRC on the Tour de Corse concluded with a one-two finish on the rally-ending Power Stage for Kris Meeke and Ott Tanak. All three of the team's cars finished inside of the top 10 at the end of an event that promised much more, but for some time-consuming stoppages. The final day consisted of two stages to the north-west of the island of Corsica. After concentrating on preserving his tyres during the first stage, Meeke set the fastest time on the Power Stage into Calvi. Claiming his third stage win of the event, Meeke was 4.5 seconds faster than team-mate Tanak. Tanak had led the rally before he had to stop and change a tyre on Saturday afternoon. 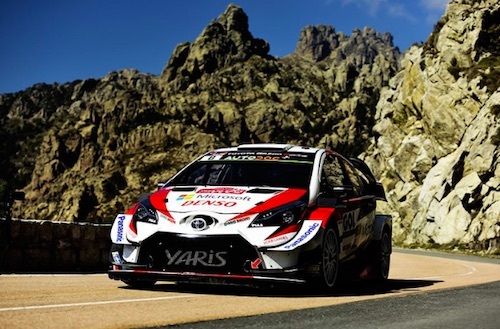 As a result, he finished sixth overall, but his four bonus points from the Power Stage mean he is only five points away from the lead of the drivers' championship. Having both lost significant time with incidents earlier in the rally, Meeke and Jari-Matti Latvala finished in ninth and 10th overall respectively. Latvala was sixth in the Power Stage, missing out on an extra point by just 0.3s. "The Power Stage was our main target for today and both Kris and Ott did a good job to get the top points. It also shows just how fast our car is on asphalt: This is the big positive to take away from this weekend. Now we must investigate the problems that we had during the rally, because it could have been a very good result for us and we need to learn from it. Still, the championships are very close and we will take confidence to the next rallies in Argentina and Chile." "Generally, it has been a good event for us: We had a strong performance and I actually quite enjoyed this year's Tour de Corse. Of course, the final result is disappointing, but this was a rally I didn't enjoy at all a couple of years ago, and we are now right on the pace and driving with a good rhythm, so there is something for us to smile about. Today was just about collecting some points from the Power Stage, and we had a clean run with no risks. The fight continues." "We were closing to scoring one or two points on the Power Stage, which I would have been happy with because I didn't have the confidence in myself to take any risks. I have been missing some speed all weekend, so it was important to just bring the car to the finish. I know that I have some things to think about to improve on asphalt, but that is for the future. For now I will put this event behind us, and try to go to the next events in South America with some new energy." "We went for it in the Power Stage today and came away with the full five points. Of course, I don't really like to have to do it like this, as I would rather be fighting for the rally win. But we had a luxury of a time gap, which allowed us to protect our tyres in the first stage this morning. That gave us good tyres for the Power Stage so we went for it, keeping in mind to bring the car home. The Yaris WRC has been incredible all weekend, I've really enjoyed driving it right from shakedown. I just have to keep the confidence and I'm sure a big result will come."